Prior planning and preparation are key to success and here I’ve shared my top 20 tips, from prioritising to procrastination, revision notes to sitting the exam, it’s all here for you in this easy to follow list. Know what the learning outcomes are for each module as you are expected to demonstrate competency in these specific goals. Know exactly when and where the exam is and what is expected from you including the duration of the exam and the number of questions to be answered. Identify your strengths and weaknesses – you should be aware of which topics you know best, this should influence how much time you dedicate to studying each topic. 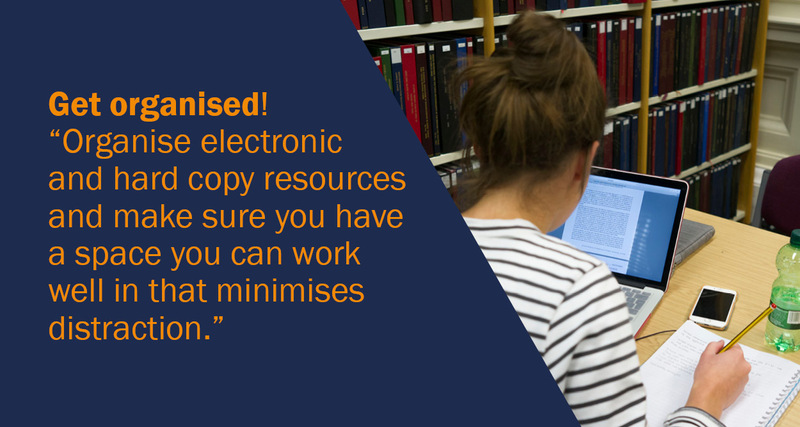 Get organised – organise electronic and hard copy resources and make sure you have a space you can work well in that minimises distraction. Study in small blocks of time and take breaks. Use alarms to remind you to take breaks and to return to revision once the break has finished. In order to get the most out of revision you need to commit information to memory, know the content and know how to apply that content in different scenarios. 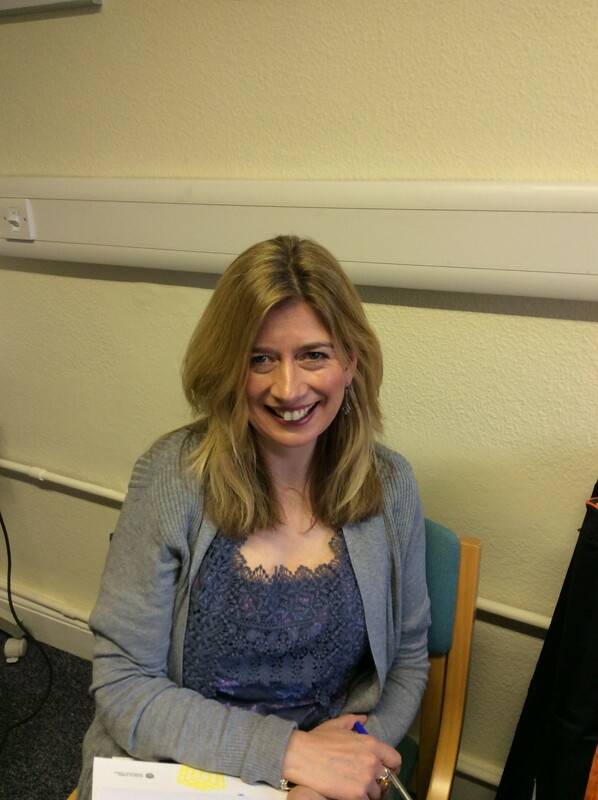 Brevity is the key – use key words, mnemonics, bullet points, lists, headings and sub-headings. Vary the style – make it visual – posters, tables, diagrams or flowcharts. Use colour, pictures, cartoons or humour. Use audio and recordings. Make it transportable – flashcards and apps. Own words – this tests your understanding of the topic and you are more likely to remember your own words. Repetition will aid revision so read, re-read, recite, rehearse, chant, drum, recall – you need to engage with the content you are learning. Critical thinking is essential, so test your-self and ask questions whilst you are revising. Do you understand what you are learning? When you revise try to do so thematically – what are the main themes emerging, why are they significant, what are the lines of reasoning presented and evidence to support these, what other ideas are available to you, what do you think? Create a bank of examination questions by typing or writing out questions from past papers or create your own exam questions. Using past papers and / or thinking of questions challenges your understanding of the topics, focuses your mind, exposes you to how exam papers look and how they are worded. Talk through your own answer. However, never learn off an answer to a topic. The chances of exactly the same question being asked are very slim, you will not be engaged in any critical thinking, remember, the examiner wants to see how you APPLY the knowledge you have, not just your recall of it. Now you can calculate how much time you have for writing each answer – you will need to remember this for the actual exam. 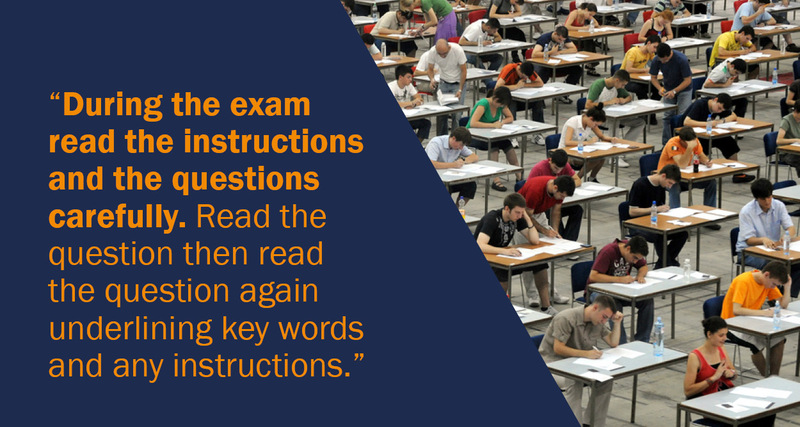 During the exam read the instructions and the questions carefully. Select, which questions you, will answer. Read the question then read the question again underlining key words and any instructions. THINK – Ask yourself what is really being asked from you. Remember exams do not simply test knowledge but your application of that knowledge. Brainstorm – Get ideas down on paper – key points, references you might use, etc. They do not need to be organised just yet. Remember to think critically, what are the main themes, the line of reasoning, and the evidence? How are these interconnected? What do you think? Why? What evidence will you use? What other perspectives are available to you? Plan your exam answers –impose order on those ideas. Know how many paragraphs you will have and what you will write in each one. Write your essay. Clear structure – introduction – main body – conclusion. Answer the question set and use academic writing conventions. Once your time is up for each answer, stop writing and move onto the next question! You will not get as many marks for 2 great answers if you were asked to answer 3 questions! Check over your paper, proof-reading to make sure answers flow well, answers the questions set, are free from basic errors and make sense. Remember there are lots of apps you can use to help you with revision, whether you want an app to create flashcards, or one for time management and alarms or something that blocks you from distractions such as social media or youtube, just do a little searching and you are sure to find something to suit. Check the Intranet for more study resources. Keep up to date with all of our blog posts, videos, tweets and posts by following us ‘studentlifecu’ on twitter and facebook. Student Support Centres are located at 50 Park Place, Cathays Campus and Cardigan House, Heath Park Campus. Further details of services, events, opening times and contacts search ‘support and services’ on the University Intranet.